I have a website and all the link showing no-follow is it good for SEO purpose? or I want to make it do-follow what should I do now? Actually my website is access with two version WWW or without WWW and it was also access index.html but now I edit .htaccess code file and and also do redirect (301) for the page index.html now website is accessing with WWW version and index.html is also redirect to home page but problem is that all internal links are showing no-follow please help me with the .htaccess code. What should I do now? For more info find the snapshot of the .htaccess code and write the code for me. No this is not good. 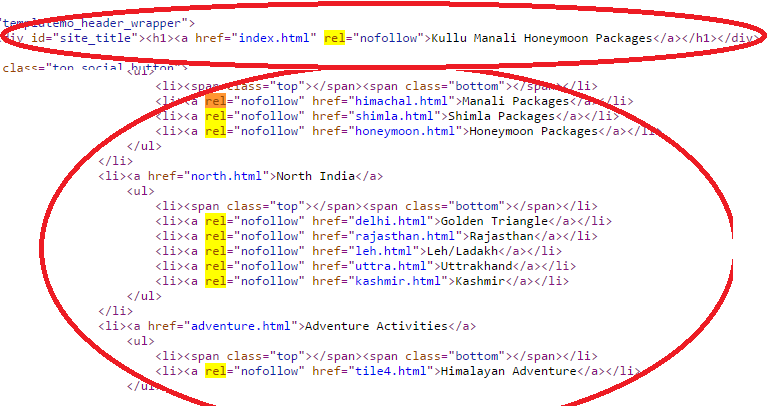 Google did not intend for nofollow to be used for internal links. It is meant to be used for links that you do not have editorial control over. This is going to hurt you a lot. Your .htaccess code is not adding nofollow to your links. It is not possible for .htaccess to alter your HTML like that. Something else is causing your problem. If you are using a CMS you need to find out if a plug-in or module is possibly doing this to your code. For internal links, links within your site, you should try to keep it dofollow. So that spider of the search engine can easily crawl each and every pages of your website. I hope you have enabled the Nofollow post status, that's why it makes each link of your post as nofollow. So change the status of "WP Nofollow Post Status" as disable. Not the answer you're looking for? Browse other questions tagged htaccess nofollow dofollow or ask your own question. How to redirect user into mobile website? Are these 3 redirect rules equal?